SAS and Teradata have joined forces to give organizations the ability to run and optimize key aspects of SAS business analytics within the Teradata® Database. With SAS In-Database Processing, SAS capabilities and analytical functions can exploit the core parallel-processing capability of Teradata. These combined efforts give organizations the powerful analytics solutions they need to address specific business issues – backed by the enterprise data warehouse performance required to execute detailed analytical processes. The result: Organizations capitalize on higher performance run times, reduced data movement, and more accurate, faster analytical development and processing. Perform complex analytics on big data and derive accurate and timely insights in minutes, not hours, leading to making better-informed business decisions. Realize a faster time-to-market by implementing best practices, reducing data movement and redundancy, and exploiting parallel-processing technology. Enable complex analytical computations to run in a distributed, in-memory environment, thereby improving data quality, data consistency and data governance for regulatory requirements. Leverage existing investments in data warehousing, business intelligence and analytical decision making to reduce your total cost of ownership. Teradata is the world’s largest company focused on integrated data warehousing, big data analytics and business applications. Our powerful solutions portfolio and database are the foundation on which we’ve built our leadership position in business intelligence and are designed to address any business or technology need for companies of all sizes. Only Teradata gives you the ability to integrate your organization’s data, optimize your business processes, and accelerate new insights like never before. The power unleashed from your data brings confidence to your organization and inspires leaders to think boldly and act decisively for the best decisions possible. For more information, visit teradata.com. Program created by SAS Institute Inc. and Teradata Corp. “Superheroes” is a registered trademark of Marvel and DC Comics. SAS and Teradata are in no way affiliated with Marvel and DC, and the content included in this website is in no way meant to be derivative of any of their characters or titles. In terms of its total volume, Saxo Bank yielded a figure of $266 billion in October 2016. Winners of the 2016 Finance Magnates London Summit Awards Just Announced! 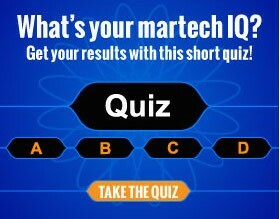 Think you know martech? Find out by taking this 3-minute quiz. See how you score and share it with friends!